We wanted to celebrate our youngest son and oldest grandson’s birthday with a family fish fry and one of the desserts that we made was . 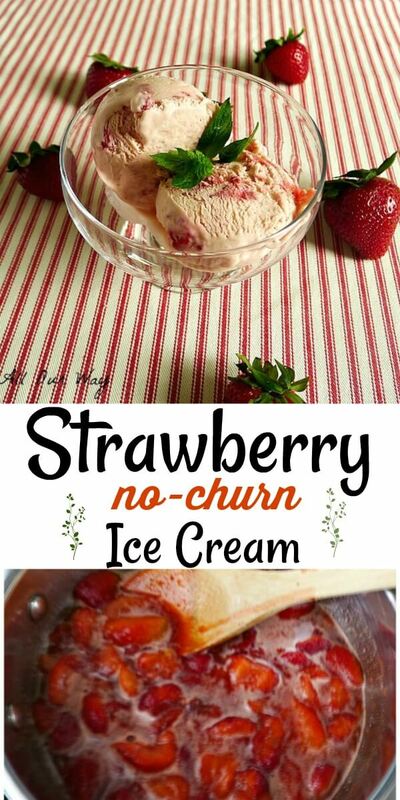 . .
No Churn Strawberry Ice Cream. And, may I say, that it was so well received that we now have orders for No Churn Butter Pecan, Oreo, Peach, Praline, Mint Chocolate Chip, Cookie Dough, Cinnamon Bun, so on and so on ice cream. When our kids were young we had an electric ice cream maker. That poor machine would churn out countless quarts of delicious ice cream. Eventually, we wore it out but we didn’t replace. By then our kids were grown and gone and we didn’t want an ice cream maker around to tempt us into making ice cream. Yes, my Honey and I have a weakness — creamy, cold, delicious ice cream. Now whenever our kids and grandkids come over, we purchase ice cream and then give them whatever is left over to take home. That plan worked fairly well until we discovered No Churn Strawberry Ice Cream. The beauty of this recipe is that the base has just two ingredients. Yes! I said just two ingredients: sweetened condensed milk and heavy whipping cream. I have to tell you, this was such a simple and easy recipe to make that I don’t know whether I’m glad we found the recipe or regretful. Just think . . . luscious, creamy ice cream any time we want and no need for an ice cream machine! No Churn Strawberry Ice Cream is just the beginning for us. You can make this rich ice cream Your Way. This recipe is a blank canvas ready for you to create your masterpiece. The other dessert we made and will be posting? Tiramisu Cake with Zabaglione Topping. No need for an ice cream maker. Just two basic ingredients will give you a start for countless variations. This recipe can be made with fresh or frozen strawberries. 1 can 14 ounces sweetened condensed milk (NOT evaporated milk) chilled in refrigerator. 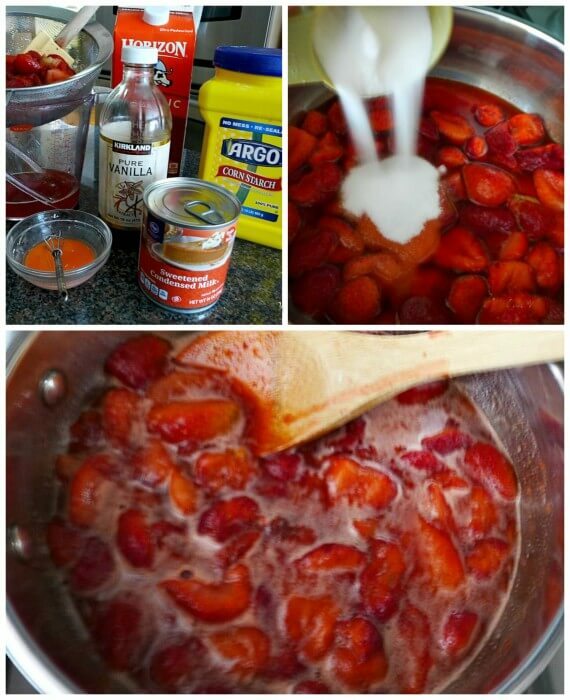 Dissolve the cornstarch in the juice (or water if using fresh berries) and add to the simmering strawberries. Stir and continue to cook until it thickens about 1 to 2 minutes. Stir constantly to prevent the compote from burning. Remove from heat and place the sauce pot in ice water, taking care that water doesn't get into the pan, stir until it cools down completely before continuing. Fit your electric mixer with the whisk attachment. In a medium size bowl whisk the sweetened condensed milk and strawberry compote until mixed. Keep cold. In your chilled bowl add the cold heavy whipping cream and beat on medium-high until stiff peaks form when the whisk is lifted. Do not overheat or you'll get butter. With a silicone spatula fold in the strawberry mixture to the whipped cream. Mix together until well mixed. Pour into your freezer containers and cover tightly with plastic wrap. Freeze for at least 6 hours or overnight. Store in Freezer. When ready to serve, take out of freezer for about 15 minutes. It does freeze hard but it is delicious. ** The strawberries are easier to slice if they are partially frozen. Inspired by Jonathan at the Candid Appetite. Note: Recipes and content from ©All Our Way are copyright protected. Please do not use content or recipe without prior written permission. If you want to share the information please link to this post. Grazie. I need to make the ASAP while I can still find local strawberries — looks so delicious and easy! This looks like a perfect way to use up the last of my summer strawberries! Thanks for sharing. Oh my gosh!! We love, love, love no churn ice creams! I don’t think we’ve made strawberry, so this is one that we’ll have to try. They’re so easy but super tasty. Love this recipe! 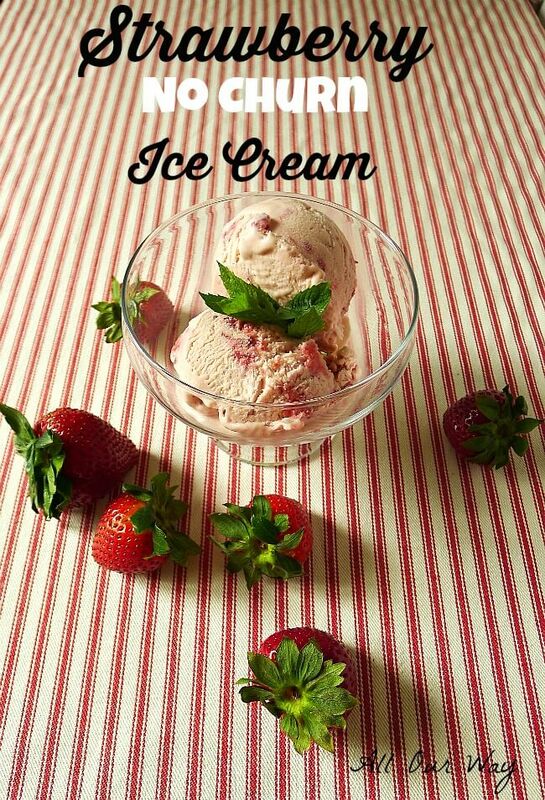 This strawberry ice cream looks so refreshing and yummy! Perfect summer treat! I especially love that it’s no-churn, I will have to make this before the summer is up! I made a no churn ice cream for the first time this summer and was blown away by how simple it was to make. This one is next on my list! We used to make ice cream like this at home all of the time! It’s been way too long. And I just so happen to have some strawberries that are perfectly ripe in the fridge. It wasn’t until recently that I realised you could make ice cream no churn! I’m bookmarking this to try it out, we LOVE strawberry ice cream! You had me at no-churn. This year we made more ice creams at home than purchased because no churn kinda is fun. I love how simple and easy this recipe is. 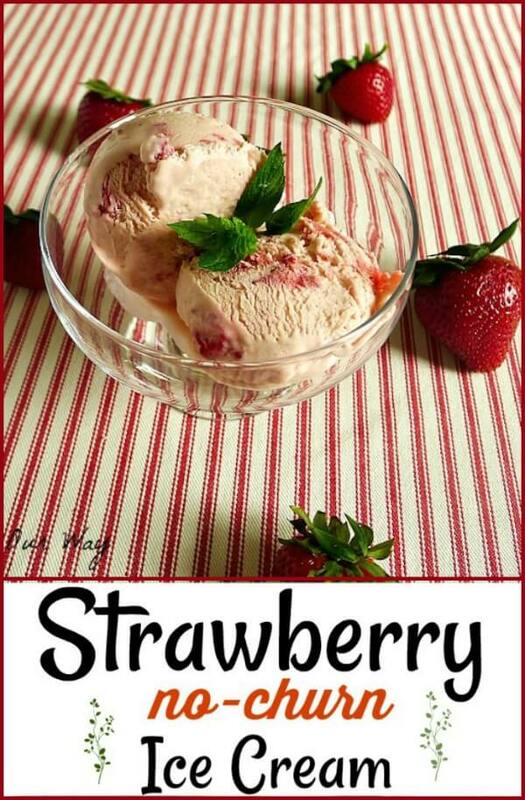 My kids love strawberry ice cream so this is just perfect for us. Such a pretty color too Marisa. I know what you mean. It’s hard to stop at two scoops. I am a huge fan for NO CHURN ice cream. No bulky equipment that takes up room in the kitchen. Your imagination has so much fun creating delicious flavour combinations you can’t find in the stores. Now only if I didn’t have to run 5 miles everytime I had some LOL. Heh! Heh! Heh! Hubby thought by us not buying an ice cream machine we’d be spared the temptation. Then we discovered no-churn!! I love that your strawberry ice cream recipe uses frozen berries… so we can enjoy it year round! Nothing beats homemade ice cream… I can’t wait to try your recipe! Frozen berries are great, aren’t they Meredith? They are frozen at the peak of the season. Happy ice cream making. Strawberry. Ice cream. Heck yes. It’s just that time of year when we need a little more sunshine in our lives, isn’t it?? And the fact that this recipe is no churn makes me one happy puppy. I just sold my stand mixer so I need something a little easier on the arms. So loving this! Hi, Kristy! This recipe is great. You can make some anytime you crave something smooth and creamy. I’m always up for an easy way to make ice cream during the summer! This looks like a simple recipe that will get me in and out of the kitchen in no time. Thanks for sharing! It’s so easy Traci you’ll want to make several batches. I can’t wait for ice cream season! This looks like one my family will love. 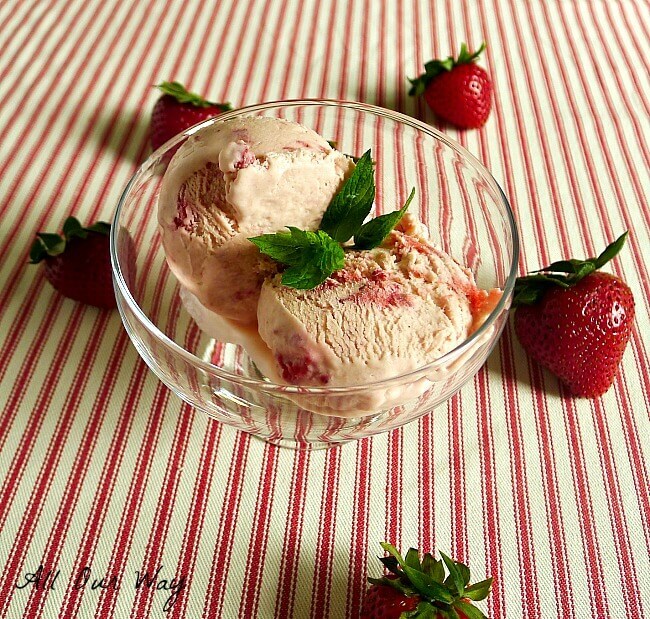 Fresh strawberry ice cream is just the best! The fella and I made the mistake of buying the new Halo Top strawberry ice cream the other night and after a bite each, we threw it straight in the trash. It just doesn’t compare to the real thing! This recipe looks heavenly! Gosh, that ice cream looks so good and I love the fresh strawberries. It is so nic to have ice cream that you don’t have to churn! This ice cream was a winner with my family! So creamy and delicious! I can’t wait to try making this with other fruits. Thanks, Marisa, for another winner recipe! I am glad you enjoyed the recipe! Let me know what other fruit you use. How about sending us some sunshine our way?? I’m not sure where to start here. So I can make ice cream WITHOUT an ice cream maker? That is awesome! My husband and kids are HUGE ice cream fans! I think it would be so much fun to surprise them with a no churn version. What do you recommend for a freezing container? What have you found to work best? I hope you and your family had a wonderful Fourth of July weekend! I am telling you this is so very simple!! The ice cream containers we got were from Amazon — they hold a quart and I bought 3 of them 🙁 . I filled them all with the Strawberry Ice Cream and then some. But if you think it won’t last that long in the freezer, any good container will do. We have even resorted to old yogurt containers. Big Hugs to you too!! 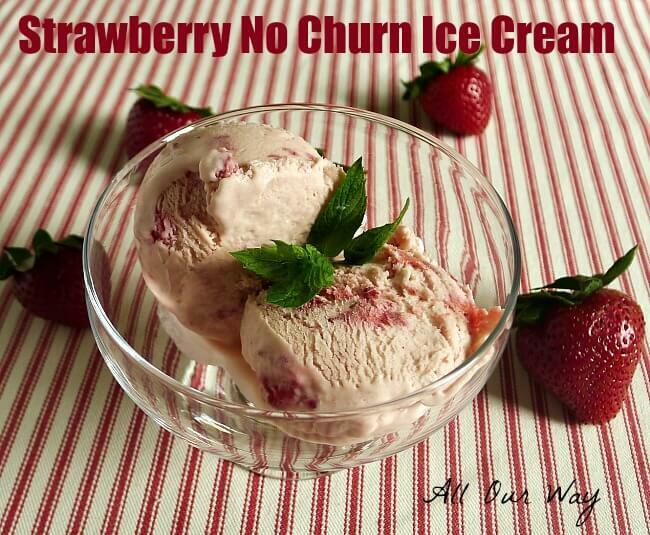 I love no churn ice cream! Especially since I left my ice cream maker when I moved 🙁 This looks amazing! I think I may have started something I may regret — I keep thinking of all of these wonderful combinations for the entire year. The strawberry ice cream was wonderful — I’m sure you’ll enjoy it. Let us know! I discovered no-churn ice cream about eight years ago in one of Nigella Lawson’s cookbooks. She uses icing sugar and double cream and it tastes great. I adapted her bitter orange recipe to mandarins as I’d had a bumper crop a few years back. I even experimented with a panettone-flavoured one for one of my blog posts – it was delicious! I have Nigella Lawson’s cookbook with the coffee one — sounds yummy. I have even seen one for Cinnabon — which is a popular sweet roll here. Wow! Seems like there is a whole new exciting ice cream world out there. My hubby wanted to call it gelato and I told him “no” because gelato has a custard base and that wouldn’t be right. I’ll have to look up your panettone flavored 🙂 Have a great weekend. Wow Marisa I have never made no churn ice cream, but you have convinced me to try it. Definitley this weekend. Thanks, have a great 4th of July! Well, I won’t have to drag the ice cream maker attachment for my Kitchen Aid out of the basement again! Marisa, you saved me! I think—-That may be a mixed blessing because now I’ll be making ice cream all the time! All kidding aside, this looks like a fantastic recipe, and I can’t wait to try it. Vanilla ice cream would be even easier……oh, my……..the possibilities are endless! Thanks for another great post. Your pictures are wonderful! Love ice cream. Actually it is the only dessert I really like. Wow – why would I make ice cream any other way? So much easier. The recipe seems quite adaptable also. Thanks for sharing this method. Marisa.